Office Space - Dunston, Staffordshire. This space is just two minutes from Junction 13 of the M6, so it is extremely well connected by rod. Various towns and cities are within an easy drive, including Wolverhampton and Stafford. 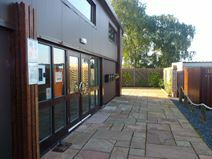 On-site, there are meeting rooms available, as well as IT support, and three large secure car parks. Tenants can access the space 24-hours a day, which is perfect if your business requires flexible working hours.